On Facebook? I started a closed Facebook group, Family Budgeters Unite! I envision the group to be a place to find and share tips, motivation, encouragement, and inspiration about family finances and budgeting. We’ll talk about what works for us and doesn’t work for us when it comes to saving and budgeting our money. I have a lot of plans for the group and I hope you’ll join me. 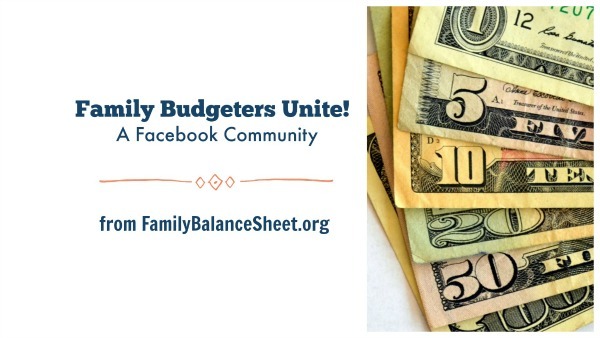 Join the Family Budgeters Unite! Facebook group. Side note: You’ll be asked 3 simple questions, when you join. I did this to keep out trolls.